Springtime in Spain is a wonderful time of the year. 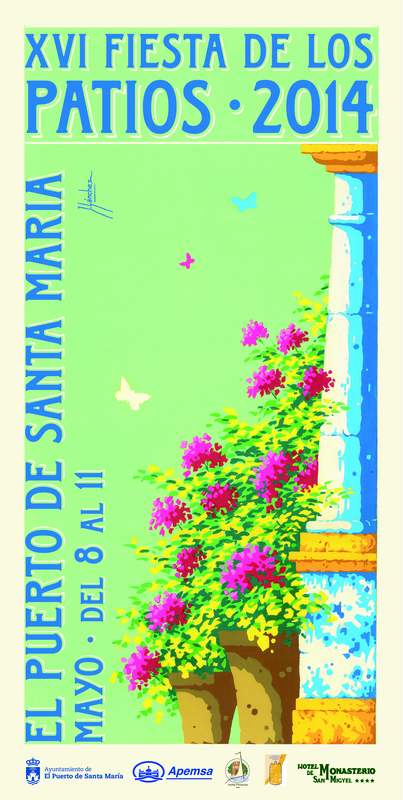 The weather is pleasant, the sun is out, the flowers are blooming – it is a perfect time to begin your exploration of El Puerto de Santa Maria. Many of these patios are found behind unsuspecting doorways and are part of palace-like homes, or even monasteries, that were built long ago by what are referred to as “Cargadores de Indias.” It is a curious name, but it is one that has strong ties to America and the rest of the “New World.” Since Columbus was convinced that he had landed in the Orient, the lands that he discovered were always referred to as the “Indies.” The “cargadores” were those persons who created transport and supply companies to serve the industries that grew out of the colonization of the New World. Throughout centuries, they provided the ships and whatever was needed to sail to the Americas and back. They also became apt traders of goods between both worlds, from which they acquired small fortunes. It is no wonder that they were able to build some amazing structures for their time. These homes can be found throughout the area in which we live (especially in El Puerto, Cádiz, and Sanlúcar) since the usual ports of departure for the New World were in Southern Andalucía. 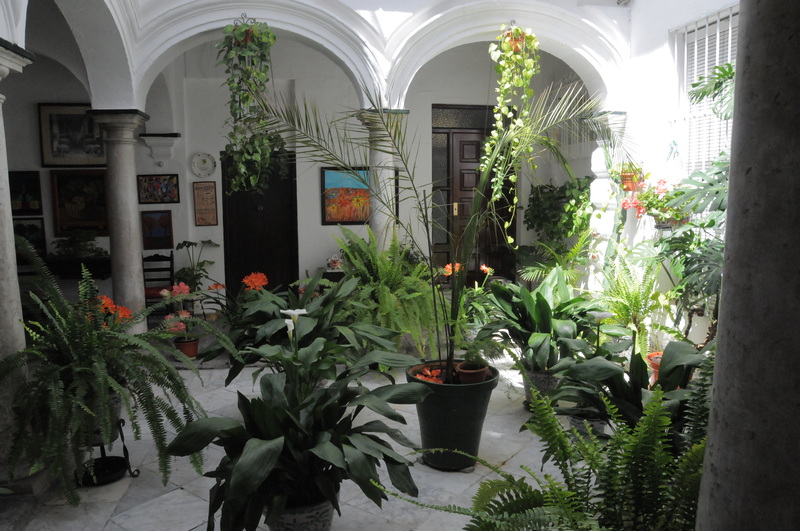 Many of those buildings featured tiled patios which were protected from the summer´s heat and were often the perfect location for enjoying plants, gardens, fountains, parties, dinners, or even solitude. They provided a nice refuge as well as a common area for families to gather. 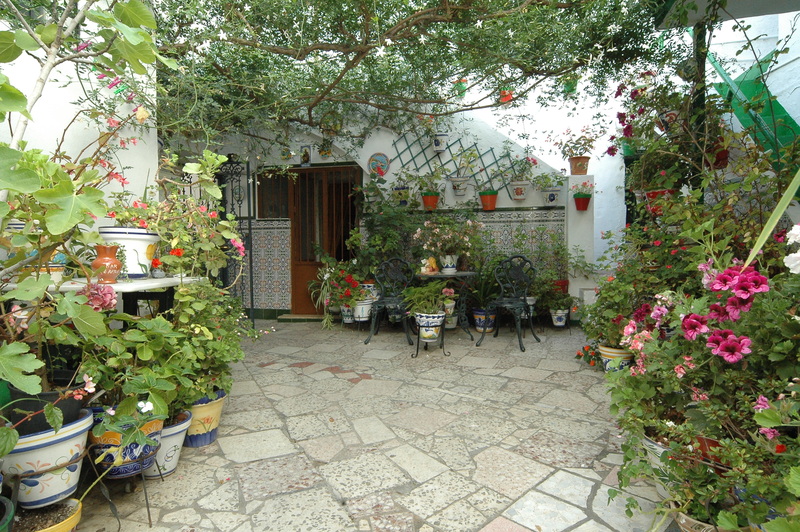 It is difficult to imagine a house in the historic part of El Puerto which does not have a patio. Of course, there are many types of Patios, along with different styles of architecture. Some are more ornate than others. All of them, however, maintain their historic, traditional, and cultural qualities. For some, they harbor the sweet memories of happy childhood. It is these vestiges of the past which the Friends of Patios want to preserve, protect, and share with you this coming week. 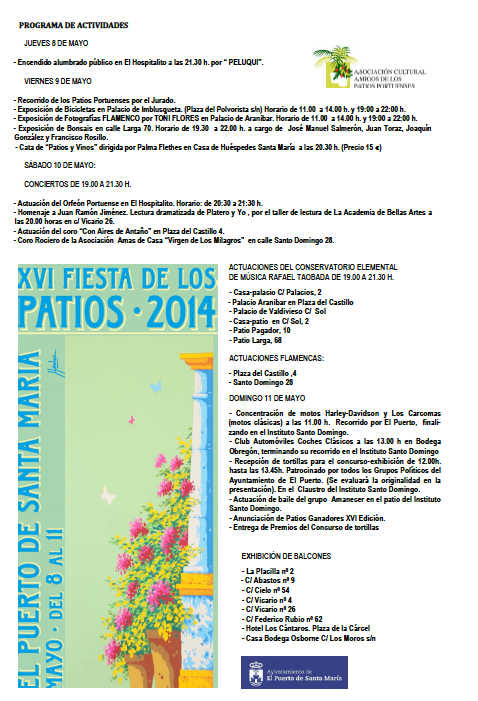 This year, from the 8th to the 11th of May, the Fiesta of Patios will be celebrated in El Puerto. In speaking with Sr. Nani Delgado Poullet, President of the Friends of Patios Association, we were surprised at the variety of activities that will be offered in conjunction with the “open house.” As it was explained to us, there is a printable map that is available on-line and which identifies the homes with patios that will be open for visits. Within most of the patios, every visitor will be welcomed and offered at least a complimentary glass of fino sherry and, at some, a tapa as well. 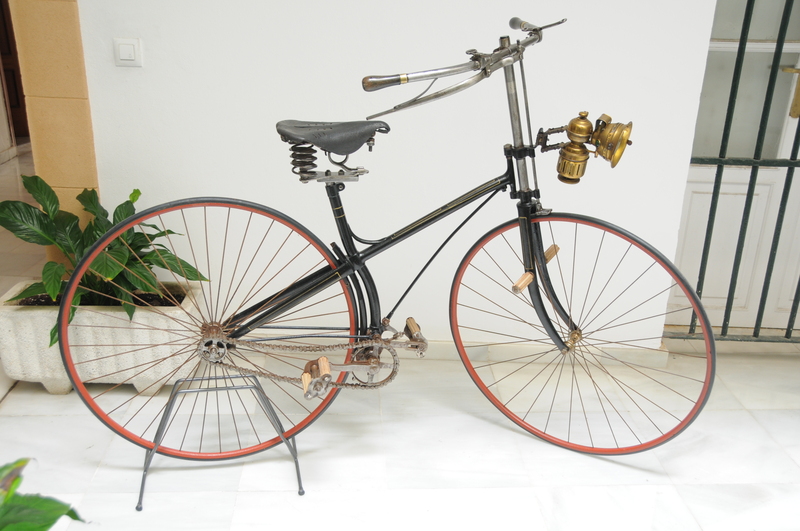 Some patios will have exhibits, for example, of vintage bicycles, photography, antiques, or even bonsai trees. On Saturday, the 10th, other patios will host performances by flamenco dancers, classical musicians, jazz musicians, chorale singers, flamenco singers, and flamenco guitarists. 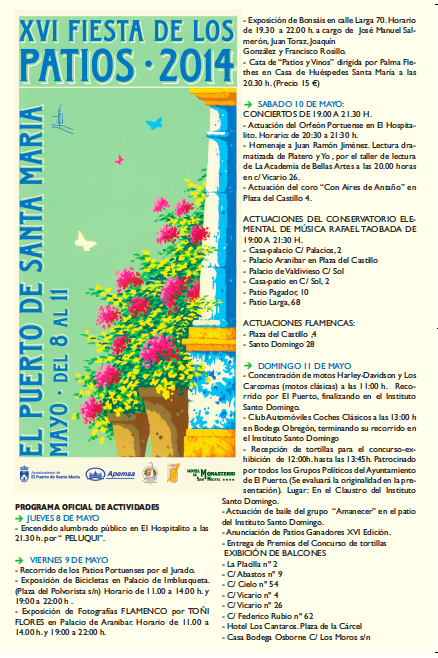 On Sunday, the 11th, there will even be a promenade, through the streets of El Puerto, celebrating this event and featuring vintage automobiles and motorcycles. 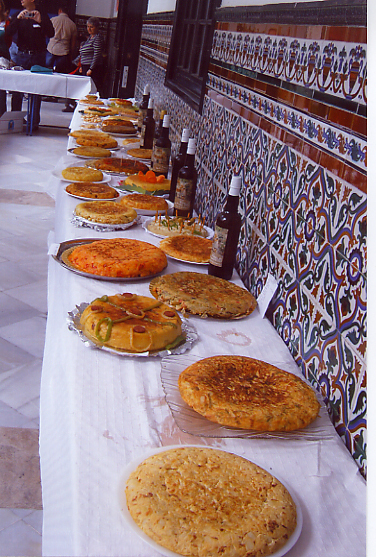 Also on Sunday, the 11th, at 2 p.m. there will be a Spanish tortilla contest at the Instituto Santo Domingo, along with a Flamenco dance performance. 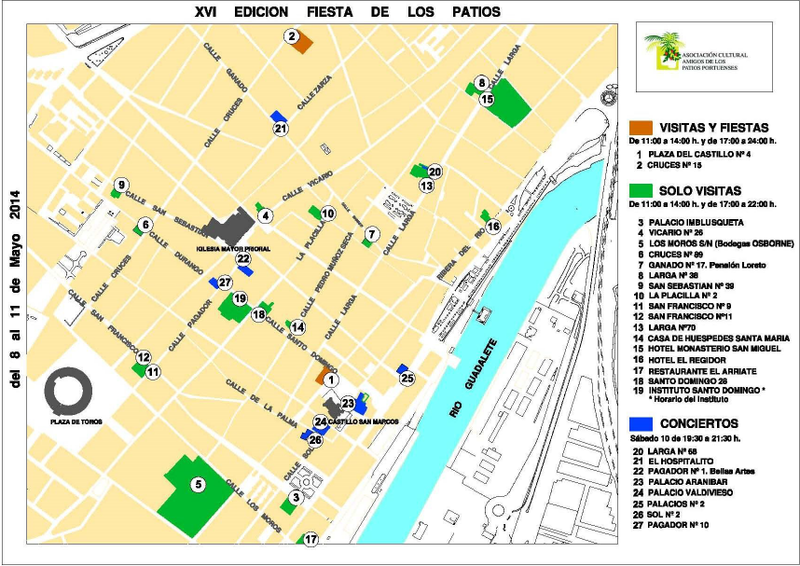 The map and schedule of activities, can be found at the Association´s website: www.patiosportuenses.com.es There are English and Spanish versions of both in order to make it easier for everyone to discover these gems. Most of the patios will also be marked with a colorful apron hanging above the doorway. There is no set route, nor order, which needs to be followed. You can visit them all, or just a few. It is a great opportunity to discover some of the hidden treasures for which Spain is known, for meeting some of our Spanish neighbors, and for enjoying their hospitality. The Association has catalogued approximately six-hundred of these patios which remain in El Puerto. Some of them are part of historical buildings, convents, communal homes, or palaces. 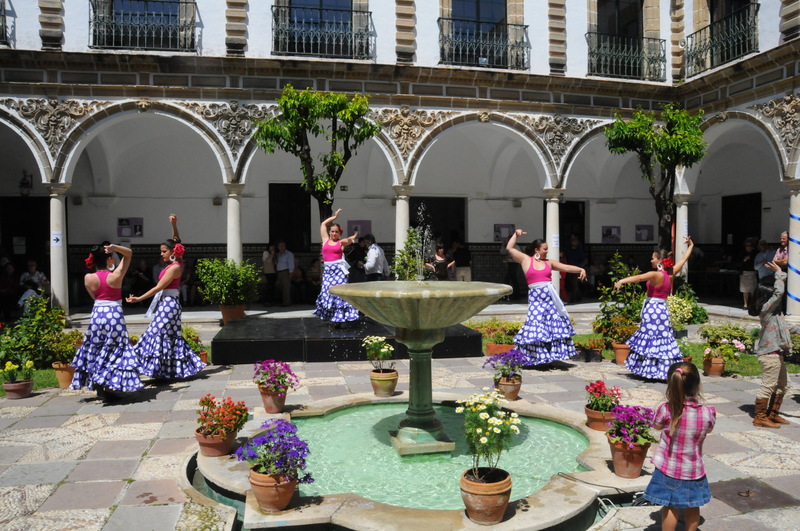 To see pictures of patios and activities which have been part of past Fiesta de los Patios, log-on to the Association´s website: www.patiosportuenses.com.es, or go to their Facebook page at www.facebook.com/patios.portuenses , or visit their blog at amigosdelospatiosportuenses.blogspot.com.es. If you plan on visiting any of the patios, or attending any of the activities, our best suggestion would be that you park at the parking lots that are next to the El Puerto bullring, or at the parking lots that are near the Catamaran boarding dock, and visit the different sites on foot. Relax, enjoy the Spring weather, and we hope to see you there! Photos by Nani Delgado Poullet.